To create awareness about colours – Red Day was celebrated atSt. Soldiers Mohali. Toddlers dressed in red were welcomed at the gate by their teachers also attired in red. Class I I-B under the guidance of Ms. Kiratleen put up the morning assembly and apprised the students that red is the symbol of love, joy, passion and happiness. It is also the colour of danger. Dressed up as strawberries, apples, water melons, carrots, post boxes and roses, they further cleared the concept of the colour Red. They stressed the importance of various fruits and vegetables which are red in colour . 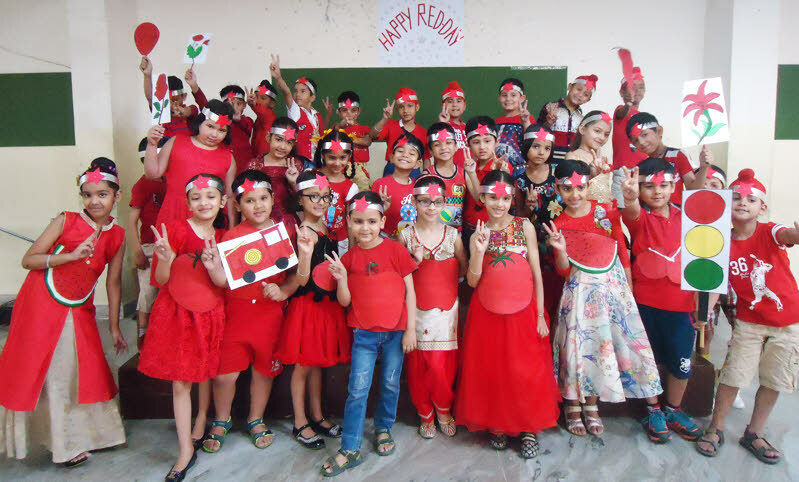 Various activities related to the colour were conducted by the Activity Incharge Ms. Deepa Sood.The little ones sang songs like ‘Red Red Apple’, ‘My Red Balloon’ and ‘Aha Tamatar Bada Majedar’. In their song they sang in praise of the colour which said that all their favourite things including their dress was red. They relished red Rooh Afza and red food items during break time and went home happily with red tattoos on their faces made by their respective teachers.